Someone once told me that South Africa was the most violent and unsafe place in the world to live. Well, a recent report in the Daily Mail would indicate it's not nearly as bad is good ol' Blighty. In the decade following the party's election in 1997, the number of recorded violent attacks soared by 77 per cent to 1.158million - or more than two every minute. Shadow Home Secretary Chris Grayling said: 'This is a damning indictment of this government's comprehensive failure over more than a decade to tackle the deep rooted social problems in our society, and the knock on effect on crime and anti-social behaviour. In Britain, an affray is considered a violent crime, while in other countries it will only be logged if a person is physically injured. There are also degrees of violence. While the UK ranks above South Africa for all violent crime, South Africans suffer more than 20,000 murders each year - compared with Britain's 921 in 2007. Now it's that last fact that people should watch. The UK's figures are climbing with more and more gun and knife crime. It's also the figure that is dropping in South Africa, if SAPS crime figures (2008) are anything to go by. 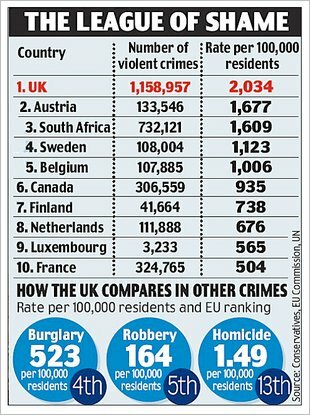 Naturally, any sort of violent crime is not good, and maybe we have a difference in reporting methods, but it's certainly something to consider when thinking about moving to the UK, or visiting SA on holiday - you're statistically more likely to be killed in SA, but more likely to get a punch in the nose in the UK (I think that's cos us Saffers are loving people who like to do a good job ;-) ).